It seems as though Saw has more instalments than teeth (do you see what I did there?). The original was innovative, tense and compelling. It was structured in an ingenious way, although all it seems to be remembered for is the violence. There was a reason for everything that happened. The Jigsaw killer was, in effect, playing God. He was dying of cancer, and so singled out individuals who were effectively throwing away their life and challenging them to fight for it; to make something of their life or die trying. Let’s be honest and say straight away that practically all of the sequels were pretty abysmal. The strength of the story was lost in favour of increasingly more violent and gory traps. I will say that there is a certain closure here, although I wouldn’t be half surprised if we haven’t seen the last of the Saw film series. Both the Jason/Friday and Freddy/Nightmare films were brought to a close, only to be resurrected shortly afterward. There are some elaborate and violent traps, but you just don’t sympathise with anyone in the film. 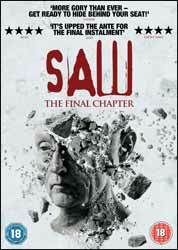 I liked the twist right at the end; it brings the entire story full circle, and proves the foresight of Jigsaw. I’ll say no more. Extras include two commentaries, deleted and extended scenes, music videos and a trailer.